Your automatic door system is bound to run into some trouble over time. This complex mechanism relies on a lot of different parts to work, and if one of them breaks down or malfunctions, it could lead to a major issue that will end up costing you time and money. With regular maintenance, however, you can prevent a lot of problems from occurring at all. While every part of your garage door system has an important role to play, some are far more crucial than others. The springs are of particular importance, as they are what supports and counter balances the weight of the door panels, and should they break, the entire system will be inoperable. Trying to replace these units yourself can be incredibly dangerous, so you're far better off letting professionals handle that. As part of our maintenance service, we will carry out door balance tests and perform the required spring tension adjustments to ensure that the system's opening and closing action remains optimal. It's very important that you have your opener's safety features checked on a regular basis, as if they malfunction, you may be at risk of a serious injury. Our experts will check the alignment of the safety sensors and the functionality of the auto-reverse mechanism. If your system fails these tests, we'll reposition the sensors, adjust the force limit settings and make sure that the opener is capable of reversing the door when there's an obstacle in its way. To keep your door's operation as silent as possible, we'll apply lubrication to various needed areas. This includes the moving metal parts, like the rollers and the hinges, as well as torsion springs and the chain or screw drive (if you have them). This won't just reduce the noise output, it will also reduce friction, which is one of the leading causes of wear and tear damage. While we do offer emergency garage door repair services, our regular maintenance visits are a great way to prevent a lot of malfunctions and problems. 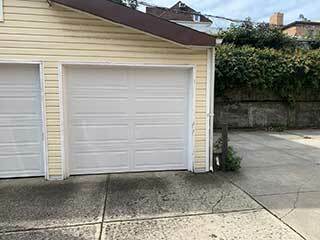 To make sure you truly get the most out of your system, have our experts at Garage Door Repair Walnut Creek service it regularly. Don't wait, schedule an appointment today.